Feed Racer is a competitive food donation app built to help FeedMore in its mission to help provide in-need Virginia families and individuals with food supplies — it’s a race to win where everyone wins. This summer, Shockoe put together a comprehensive intern program focused on the delivery of a fully developed application to drive a community initiative. Mason, Rebecca, Misty, Paulina, and the many members of Shockoe structured the project as well as our professional growth around a project with clear direction and purpose. 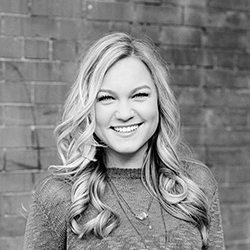 Our intern project ultimately took shape as we conceived, designed, and developed an app to help bridge donors and the food bank in the Richmond area. During the discovery phase, we met with on-site with FeedMore, one of the major food banks in central Virginia. They taught us about their donation, collection, storage, and delivery processes and how they plugged into the pantry network — an expansive operation that exists on a scale much larger than we had expected. FeedMore’s largest obstacles were centered around food donations, money, and time (i.e. volunteering). We learned that FeedMore’s largest wins come when more people engage by giving back, in one way or another. So we jumped on our research and investigated creative ways to engage people in this context. We began drafting up methods focused around playful competition which incentivize camaraderie around shared goals and driving desired donation behaviors. We chose a race-centered theme because we believed that collecting food should feel more impactful and playful. 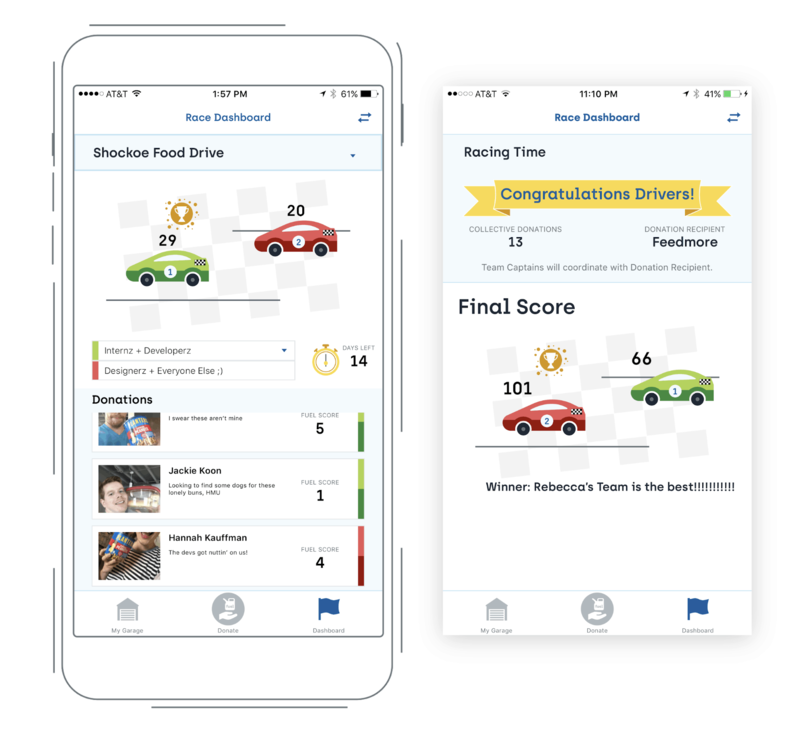 Feed Racer promotes gamification, repeat involvement, and participation versus typical food drives that people forget after one-and-done donation. The team with the highest accrued fuel score at the set finish date will be crowned the winner of the race. With our limited time frame we left some open ends on the project we hope to wrap up in time. 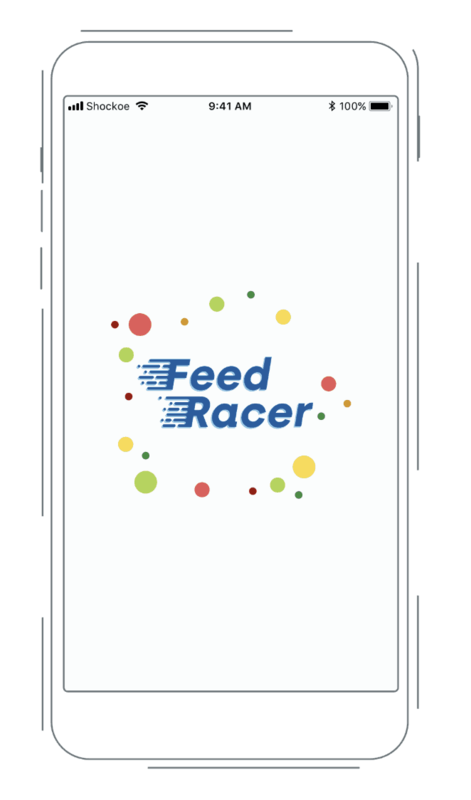 A future roll out of Feed Racer will integrate rewards and badges where users can keep track of their progress, “lap battles” to incentivize donating specific items (a great option for FeedMore when supplies of a specific category are low). Last but not least, we hope to improve user, or “captain” in this case, permissions to allow more effective moderation of ongoing race. We are optimistic that our project can be an impactful concept to help promote community initiatives around food donations. We are thankful to have had a chance to work through countless research, strategy, wireframes, designs, and development and giving us the insight to understand what it takes to create not just an application, but a method of engaging donors with the mission of a non-profit. We look forward to seeing it fully in action in the not-distant future!